When replacing the brake pads, it is not necessary to disconnect the brake hose or disassemble the brake caliper. the brake pads as a set. Always install new brake pads, a new brake pad spring and a new brake pad support as a set. a. Connect a clear plastic hose "1" tightly to the bleed screw "2". Put the other end of the hose into an open container. b. Loosen the bleed screw and push the brake caliper pistons into the brake caliper with your fingers. c. Tighten the bleed screw. d. Install new brake pad support, a new brake pad spring and new brake pads. The arrow mark "a" on the brake pad spring must point in the direction of disc rotation. Brake fluid level Below the minimum level mark "a" → Add the recommended brake fluid to the proper level. Refer to "CHECKING THE BRAKE FLUID LEVEL" on page 3-18. 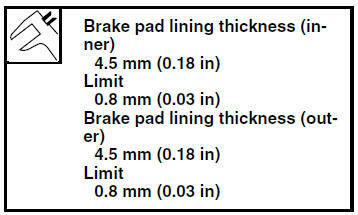 Refer to "BLEEDING THE HYDRAULIC BRAKE SYSTEM" on page 3-20.